South and North Korea are presumed to resume the joint excavation of an ancient palace site in North Korea as early as next week, according to the Ministry of Culture, Sports and Tourism. 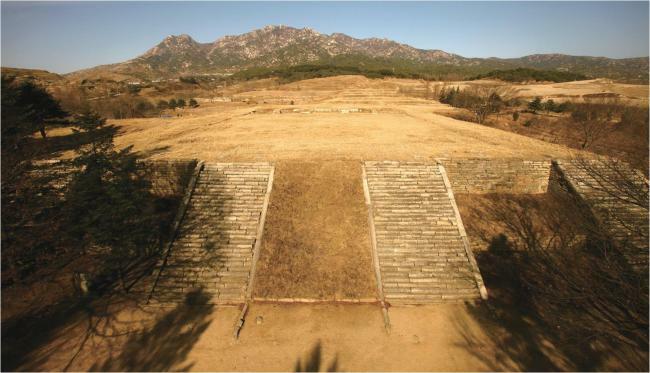 The joint dig of Manwoldae, where the remains of the royal palace of the Goryeo Kingdom (918-1392) once stood, has been considered both a symbolic and substantial step for the two Koreas to reconcile their differing views on Korean history. Officials said North Korean scholars told their South Korean counterpart the Inter-Korea Historian Association that they wished to resume the dig on Oct. 22. The two sides had originally intended to start the joint survey and preservation on Sept. 27 and continue until Dec. 27, but recently requested a delay, citing a lack of preparation. Cultural Heritage Administration head Chung Jae-suk formally suggested to North Koreans to resume the joint dig earlier this month, when she visited Pyongyang as part of the South Korean delegation accompanying President Moon Jae-in for his summit with North Korean leader Kim Jong-un. South Korean scholars’ studies on the lives of Goryeo royals had been limited due to the fact that the ancient kingdom’s capital city Gaegyeong is in North Korean territory, where there city of Kaesong, North Hwanghae Province, is now situated. The project was agreed upon in 2006 and kicked off the subsequent year, after which South Korean visitors carried out seven excavations before being were shut down in 2015 due to icy inter-Korea relations during the Park Geun-hye administration. Scholars here hope the Manwoldae project will spark other research inside North Korea, including an excavation of ancient Goguryeo Kingdom tombs in Pyongyang.